Taking advantage of butter’s current, albeit controversial, status as ‘back’, chefs and manufacturers are taking the ingredient to new levels with innovative flavours and formats. “Chefs, producers and dairy companies are excited about butter being back … and are taking it to new flavour places by consolidating all the flavour that is innately in butter and can be cooked out of butter naturally or infused into butter,” Kara Nielsen, a trendologist, said during a recent Packaged Facts webinar to promote an upcoming report on 2017 culinary trends. For example, cultured butter is making the jump from a novelty to something sought after by consumers in retail stores, she said. Part of the appeal is an enhanced tangy flavour, but consumers also are drawn to the heritage production of cultured butter, Nielsen said. “This is how butter used to be made after the cows were milked, the cream was left on top before churning and the micro-organisms in that cream would convert the simple sugars into lactic acid, bringing in different tastes of the sour, sweet, salty and bitter umami,” Nielsen said. 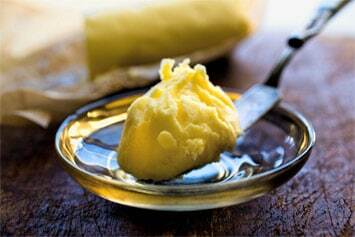 Examples of cultured butter already in the market include Kerrygold, Organic Valley and versions from Trader Joe’s, Vermont Creamery and the Sierra Nevada Cheese Company. Brown butter also is crossing over from a made-to-use ingredient favoured by pastry chefs for its nutty, caramelised flavour, to something packaged and sold at retail for convenience, Nielsen said…..